Those who follow me on Facebook already know about my stellar Valentine’s Day gift from Husband. He swung by the local spa on his way home from work to pick up a gift certificate for a massage. The spa was closed. 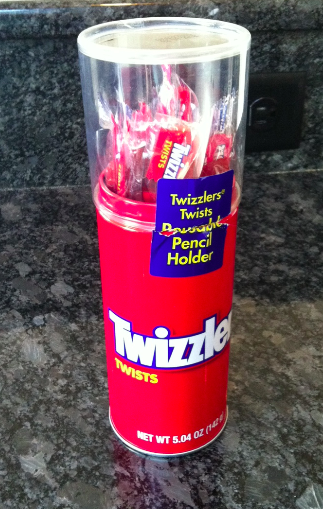 So, I wound up with Twizzlers. In a handy reusable pencil holder. ‘Cause nothin’ says I love you like a pencil holder. Seriously, though, I’m in the “It’s a Hallmark Holiday” camp and don’t really feel the need for senseless money to be spent on Valentine’s Day. I know Husband loves me. He knows I love him. And, I think it’s the conversations and moments that we share on the days that aren’t commercialized that really matter. For instance. I was making dinner a few nights ago. The kids were watching a movie in the living room, sitting together in front of a fire in the fireplace. Husband and I were in the kitchen, each enjoying a glass of wine. Dinner would be ready soon and we’d sit, as we always do, at the kitchen counter and watch Jeopardy! together over dinner. We’d give our answers out loud, acknowledge a particularly good get by the other, make snarky comments about the contestants and usually, by the time Trebek was shaking hands with the winner, we’d be cleaning up and getting ready to put the boys to bed. Do you remember when we were dating and we asked each other if we’d ever been in love before? And we both said that yes, we had been. I think I’d change my answer if you asked me today. If I was ever in love before you. I don’t think I’d say yes anymore. Because I think that back then I really had no idea what really being in love felt like. No idea what it really was. What it could be. I mean, back then, before you, I was so uninvested. Love was such a simple, blank canvas. And now, it’s like love is something else entirely. It’s me and you as a family. It’s those kids. It’s our home. Our LIFE. None of this is anything without you. Without “us”. Love is just so different today. It just means so much more. It’s so much more valuable. You know? Man. I really wish I had some Twizzlers right now. Aww. That’s sweet. I guess in a way i fool myself into thinking i know what love is but like most people say I’m too young…*shrug* I don’t know. No problem! Thanks for the reblog. What is Love? For years now -even though I haven’t had a strong relationship with anyone- I always thought in my own special way I understood what “Love” was. Then again I’m a Cancer so my emotional system is always out of wack…..over analyzing everything.but I’ve said multiple times in both my past blog posts and Poems that love is extremely complicated. Love can different from person to person and Today I read a post from http://www.serialswooper.com where the author explains her look on what love is explaining the relationship between her and her husband. Then explaining that a true Valentine’s Day doesn’t need you to spend an huge unnecessary amount of money to prove how much you love someone…..
How beautiful! I want Twizzlers right now too! Sniff. Great Blog Swooper. Keep thinking that way for the next 50 years. I love that he bought you Twizzlers! What a beautiful sentiment, girl! You are sooo right. It’s the investment that is love. And the time you spend together that are insignificant that mean the most. Although, I do love me our family Valentine’s celebration. I’m a Red Vines girl myself, but your message came through loud and clear. Hope all is well with you.